The 2018 Hyundai Sonata Plug-In Hybrid gets a mild refresh for the middle of the year and a slight, I mean very slight, price bump. That said, for your money, between $33,250 and $38,850, depending on model, you get a giant basket of standard stuff. The main story here is that styling for the hybrid now matches that of the already released Sonata gasoline models. The Korean auto giant says you can travel for 28 miles using all-electric drive, even though the starting price for the 2018 Sonata Plug-In Hybrid has dropped $1,350 from the 2017 model. The Sonata Plug-in Hybrid Limited, however, gets a price bump by $250, but now comes with a bunch of new features. Seriously, the list is crazy complete, with Automatic Emergency Braking with pedestrian detection, LED Headlights with Dynamic Bending Lights, Lane Keep Assist, and Driver Attention Alert. The Forward Collision Warning is now enhanced with an Automatic Emergency Braking function, and the Lane Departure Warning now adds a Lane Keep Assist function. There’s an additional USB charge port and a wireless charging pad for mobile devices. The steering wheel is heated and the Bi-function LED headlights with dynamic bending lights are there for the ride in 2018. 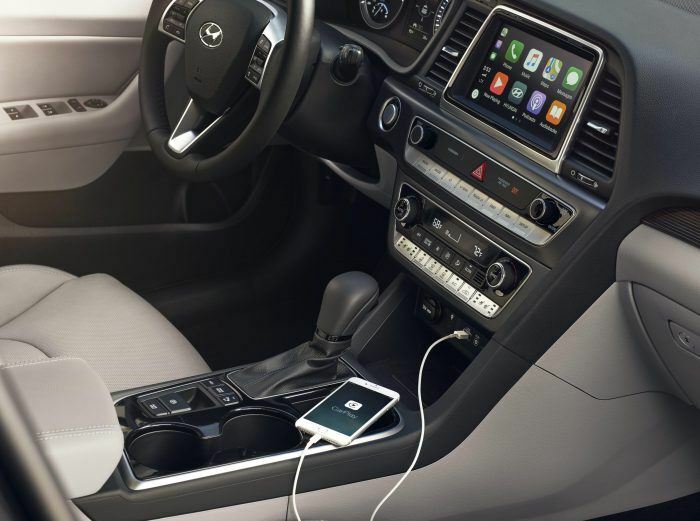 The 2018 Hyundai Sonata Plug-In Hybrid receives a seven-inch Display Audio color touchscreen, a backup camera, Apple Carplay and Android Auto compatibility, plus iPod, USB, and AUX input jacks. Photo: Hyundai Motor America. And like I mentioned, the all-electric range is up to 28 miles, an improvement of one mile. While Hyundai’s Plug-In Hybrid tech gets you a 99 EPA-estimated MPGe rating, the hybrid efficiency nets you 39 mpg. Add everything up and you get a total driving range of an impressive 600 miles. The old school portion of the drivetrain ain’t that old school. It’s a 2.0-liter GDI four-cylinder Atkinson Cycle engine, which is nifty. The electric motor portion cranks out 50 kW (that’s 67 horsepower, which is a better way to put it) and that’s hooked up to a six-speed automatic transmission versus the now chic CVT. The 50 kW electric motor is 32 percent more powerful and allows for more efficient EV operation during higher engine loads and speeds. 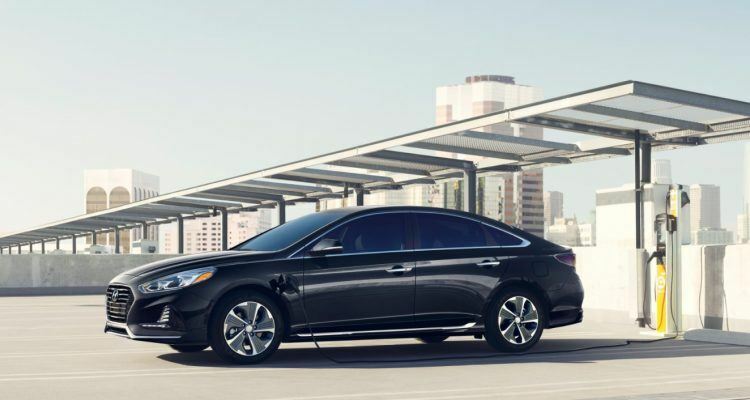 The battery pack is a state-of-the-art 9.8 kWh lithium-ion polymer deal that’s more than five times larger than the Sonata Hybrid’s battery, and can be charged using a 240V Level 2 charging station in slightly less than three hours. 2018 Hyundai Sonata Plug-In Hybrid interior layout. HD and satellite radio are included, along with heated seats and dual zone climate control. Photo: Hyundai Motor America. The exterior now includes a more dynamic front fascia with new sheet metal on the hood and front fenders. 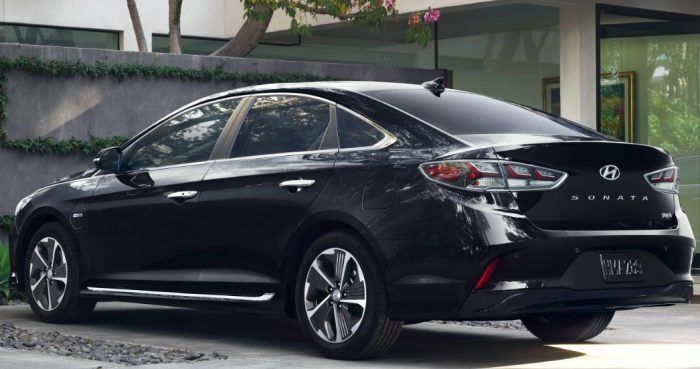 The design refresh, naturally, incorporates the new Hyundai signature cascading grille shape, and the new rear deck lid allows for a sleeker, coupe-like appearance they say. The 17-inch eco-spoke alloy wheels have been redesigned; there’s distinctive blue bezel headlights and taillights with a clear outer lens to further highlight the refreshed styling. Naturally, the Sonata Plug-In Hybrid’s interior has also been updated with a revised center stack area and instrument cluster, while the steering wheel now has a sportier leather-wrapped three-spoke design. Like I said, that’s a lot for less than 40-large, y’know? No Comments on "2018 Hyundai Sonata Plug-In Hybrid: A Brief Walk Around"